In 2018, the children of the Church mark the 36th anniversary of the appearance of the myrrh-streaming Montreal-Iveron Icon of the Mother of God (November 24, 1982), the 21st anniversary of the martyric death of its guardian, Brother Jose Muñoz-Cortes (October 31, 1997), and the 11th anniversary of the appearance of the myrrh-streaming Hawaiian-Iveron Icon of the Mother of God (October 6, 2007). Preparations for the Washington Cathedral of St. John the Baptist’s 20th annual pilgrimage to Holy Trinity Monastery in Jordanville, NY began long before that event. Registration opened after the parish’s patronal feast of the Beheading of St. John the Forerunner & Baptist of the Lord, and in a matter of days, all of the seats on the tour bus had been reserved. In preparation for the two-day visit to the "Diasporan Lavra," provisions had to be purchased and food prepared for the many pilgrims and for the monastic brotherhood. From the very first of the pilgrimages, this had been the parish’s practice, so as not to excessively distract the monks from their vocation of prayer; it was a practice requested by the ever-memorable abbot of Holy Trinity Monastery and First Hierarch of ROCOR, Metropolitan Laurus (Skurla; +2008). 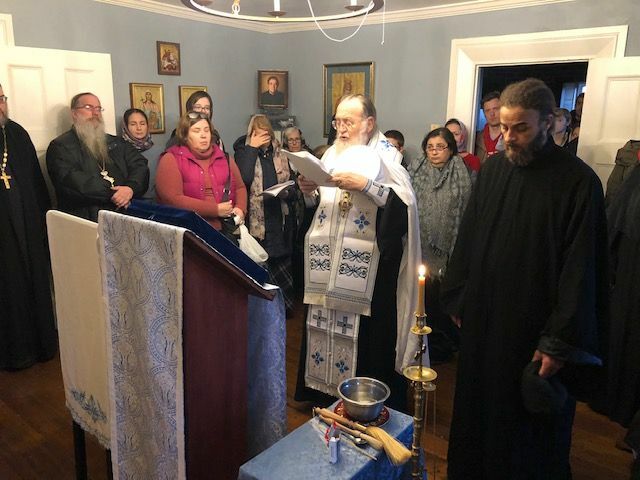 One week before the Washington pilgrimage, on October 27/28, Archpriest Serge Lukianov brought a group of parishioners from the Diocesan Cathedral of St. Alexander Nevsky in Howell, NJ to the "Diasporan Lavra" to honor the memory of Jose Muñoz-Cortes. On Friday, November 2, the eve of the pilgrimage to Holy Trinity Monastery, pilgrims who lived far from Washington arrived in the nation’s capital to spend the night in the parish house, to go to Confession, and to join in preparations. The local group of pilgrims was joined by Orthodox Christians from the West Coast of the United States, other states, and Canada. The wonderworking, myrrh-streaming "Hawaiian" Iveron Icon of the Mother of God was brought from far-off Honolulu, and arrived at the cathedral at 8:00 PM on November 2. It was brought by Priest Athanasius Kone, the newly appointed rector of the Honolulu parish of the Hawaiian Iveron Icon of the Mother of God. The church was filled to capacity for a moleben and akathist to the Most Holy Theotokos. After the service, four priests of the cathedral heard pilgrims’ confessions. At 5:30 AM the next day, November 3, about 50 people gathered near the church. An enormous store of provisions and the pilgrims’ personal effects were loaded into the bus, all were seated, and the bus soon set off. Following the bus was a church van and several private cars filled with pilgrims. The road from the capital to Jordanville is long, with the journey taking more than seven hours, but thanks to prayers, fraternal fellowship, and religious discussions about the history of the monastery and Brother Jose’s martyric struggles, the time quickly flew by. Each pilgrim had the distinct honor of holding the myrrh-streaming Icon in his arms, and having the opportunity to offer up personal prayers. 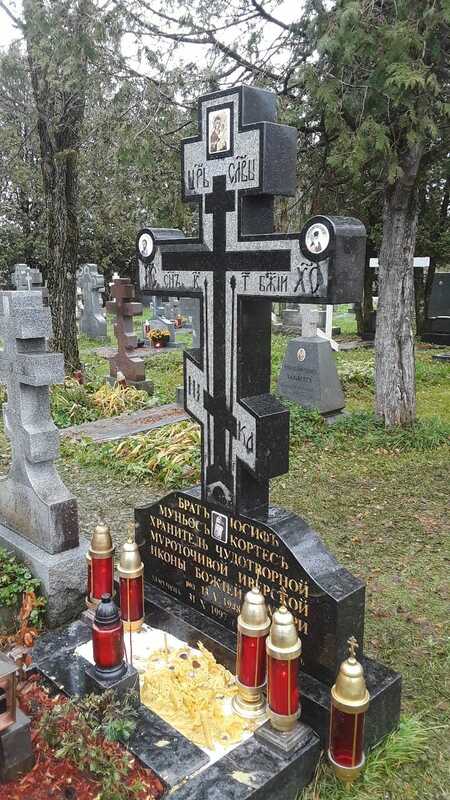 At 3:00 PM, the pilgrims arrived at the monastery cemetery for the first panihida for Brother Jose, martyred in 1997, the faithful guardian of the myrrh-streaming Montreal-Iveron Icon of the Mother of God. The weather was rainy, but the moment the opening words of the panihida service, "Blessed is our God…" were pronounced, the rain stopped. The requiem service was served by Fr. Victor, co-served by Archpriest Zoran Radovic (rector of St. George Serbian Church in Elizabeth, NJ), Priest Stephen Kaznica (rector of Sts. Peter & Paul Patriarchal Cathedral in Passaic, NJ), and Fr. Athanasius Kone of the Church of the Iveron Icon of the Mother of God in Honolulu. The faithful in attendance chanted the service. Commemorated at the panihida were not only Brother Jose, but also Schema-Abbot Clement, who in 1982 had presented him with the Icon, which shortly thereafter began to stream myrrh, and Archbishop Leonty (Filippovich; +1971) of Chile, who had brought Jose into the Orthodox Faith. After the panihida, during the singing and reading of the Akathist to the Montreal Icon at Brother Jose’s graveside, all those present were anointed with holy myrrh from the Hawaiian-Iveron Icon, and all who desired received a small bottle with oil from the lamp on Brother Joseph’s grave, soil from his gravesite, a small photograph of the chosen one of the Mother of God, and a booklet with a canon and akathist to the Montreal Icon. The pilgrims likewise all partook of kutia blessed on his grave. The Washington group was joined by a large contingent of Serbian pilgrims from Toronto, Canada, led by Archpriest Jovan Marjanac and a group from the St. Panteleimon Parish in Hartford, CT, led by its rector, Archpriest Dionisy Nalitov. After the evening meal, the pilgrims assembled at the monastery’s Holy Trinity Cathedral for the greeting of the wonderworking Hawaiian Icon and the festal three-hour monastic Vigil. Throughout the service, in the lower Church of Venerable Job of Pochaev, Fr. Victor and Archpriest David Pratt, newly assigned to the Washington cathedral, heard the confessions of pilgrims who wished to receive Holy Communion the following morning. On Sunday, November 4, His Eminence, Metropolitan Hilarion, celebrated Divine Liturgy. Concelebrating were a multitude of priests and several deacons. The faithful were profoundly impressed by the harmonious and tender chanting of the seminary choir, directed by Deacon Nicholas Kotar, a great connoisseur of liturgical chant. After the meal, the pilgrims divided up into smaller groups in to tour the monastery and visit the museum to view the remarkable exhibition dedicated to the 100th anniversary of the murder of the Royal Family. At 3:00 PM, the pilgrims once again gathered at Brother Jose’s grave for a farewell panihida. As always, the neatly cleaned gravesite was covered by a multitude of candles placed there by the faithful. Metropolitan Hilarion served the panihida, assisted by Fr. Victor and Fr. Stephen Kaznica. Also present were Archimandrite Luke (Murianka), abbot of the Monastery, as well as other clergy and brethren of the monastery. 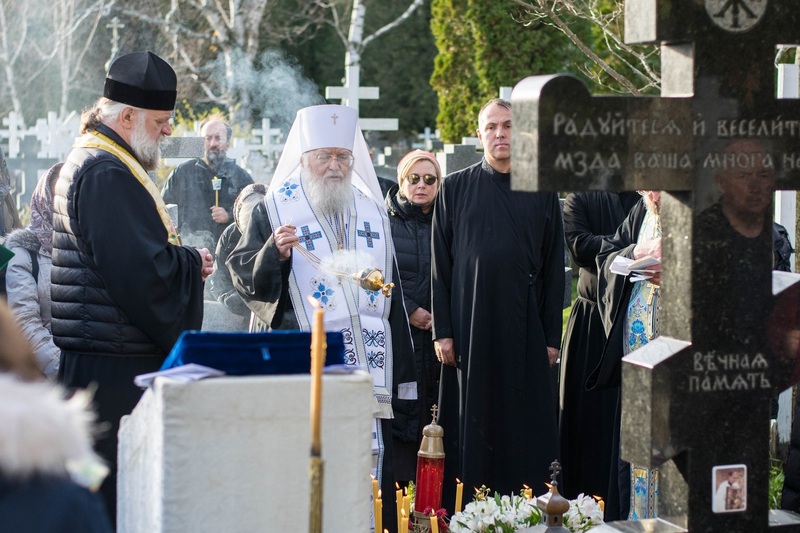 Commemorated at the panihida were Brother Jose and the ever-memorable Archbishop Averky (Taushev; +1976), abbot of Holy Trinity Monastery and rector of Holy Trinity Seminary, Hieromonk Averky (monastery cleric), and seminary professor Protopresbyter Michael Pomazansky, who reposed on November 4, 1988. After the service, and with Metropolitan Hilarion’s blessing, Fr. Victor delivered a sermon in Russian and in English about Brother Jose. He called to mind Brother Jose’s oft-repeated instruction that "one must not become accustomed to a miracle." According to Fr. Victor, those words should be taken literally. Perhaps we had become too accustomed to the Montreal Icon, to some extent had taken it for granted, and had not sufficiently valued it; as a result, in 1997, the Lord deprived us of both the Icon and its Chosen One, Brother Jose. That loss was the impetus for the issuance of an encyclical by the Synod of Bishops in 2002, calling us to repentance over the loss of the Montreal Icon. Further, Fr. 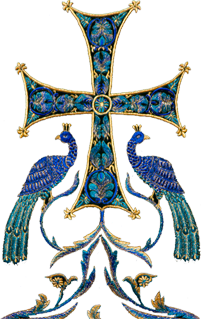 Victor expressed his conviction that this call by the bishops of ROCOR for repentance, a message still relevant today, opened the way toward further development and completion of the process of restoring Eucharistic communion between the MP and ROCOR. A video of the sermon can be viewed here. Fr. Victor thanked those present for their devotion and support for veneration of Brother Jose, and for remembering his remarkable and unique service to the Church of Christ. He also noted that the miraculous sign of the myrrh-streaming Hawaiian Icon is a direct continuation of the miracle of the Montreal-Iveron Icon, and that we "must not become accustomed to" this new miracle. 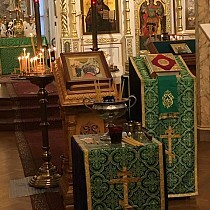 After the panihida, everyone departed for the newly acquired home of the Women’s Skete of the Holy New-Martyr Grand Duchess Elizabeth, where Metropolitan Hilarion celebrated the Rite of Consecration of a cozy chapel dedicated to the three wonderworking Iveron Icons – the original Athonite Portaitissa, Montreal, and Hawaiian Icons. Spiritually enriched by their stay at Holy Trinity Monastery and by warm fraternal fellowship, the pilgrims did not even notice how quickly the seven-hour journey home flew by. 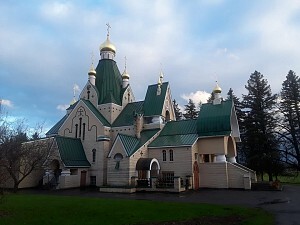 May God grant that ever more people, and at all times, visit and support Holy Trinity Monastery and the place where the Chosen One of the Mother of God is laid to rest, and may the Lord grant the coming of the blessed day when Brother Jose is glorified and joined to the rank of saints, the final Orthodox martyr of the 20th century.